How-diddly-doodle-doo? 😉 I’m Ned-Flanderizing this because I’m so excited about our new VLOG on YOUTUBE!! For those of you who are interested in being weirded out entertained by our tips, recipes, and motivational cinema, please subscribe to the Youtube channel “Packard Family Health.” We would love to see y’all there!! Put this in the blender (we use our Blendtec) and mix as if it were a smoothie. I originally began eating this as a “milkshake” but became too much for me. So, I pulled down my Popsicle molds, washed them out, and voila! YUMMY!!! I place these ingredients into a food processor before adding the rest. I put the rest of the ingredients into the food processor and viola! Perfect! Next, I made some homemade guacamole. It’s really quite simple and so delicious! It’s easy from here! First you smash the avocado meat with a fork, then add the rest of the ingredients. Be sure to stir it well to mix in the flavors together. I add a little salt for taste as well. My daughter Amber tells me that if you store the excess guacamole with the seed from the avocado, then it lasts a little longer. Now for the taco salad. I put about 1/2 cup brown rice on the bottom, then place about 3/4 cup black bean on top of that. Next, romaine lettuce that has been cleaned and torn. I like to add chopped green onions, bell peppers, and tomatoes. 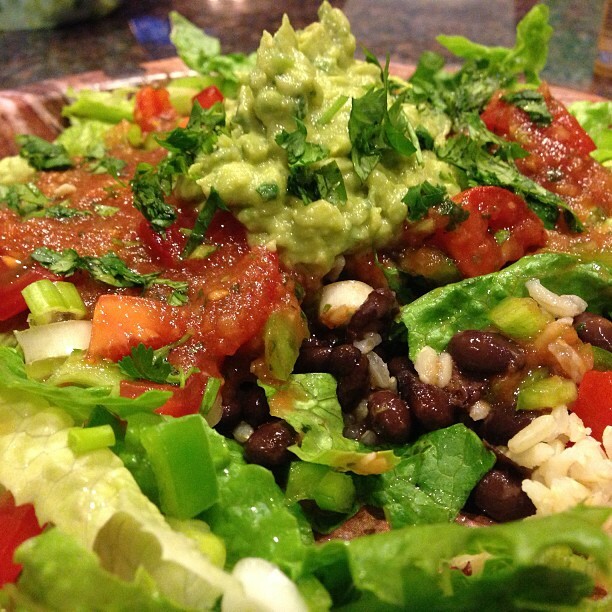 Finally, I top this with a generous portion of homemade salsa, and a big spoonful of guacamole. For garnish, I put the chopped cilantro leaves on top. Oh my my my! I thought I had died and gone to heaven! This was DELICIOUS!!! They say that the more colorful your plate is, the healthier it is. Excepting skittles and M&Ms (as my clever J.D. husband never fails to remind me) I have found this to be very consistent. I usually steam the broccoli and green beans in my electric steamer that my dad so eloquently depicted for you all. In addition to maintaining a hefty supply of raw kale for my salads, I love to bake kale chips. They taste kind of like potato chips, and would probably be a great way to introduce this health-packed vegetable to children. 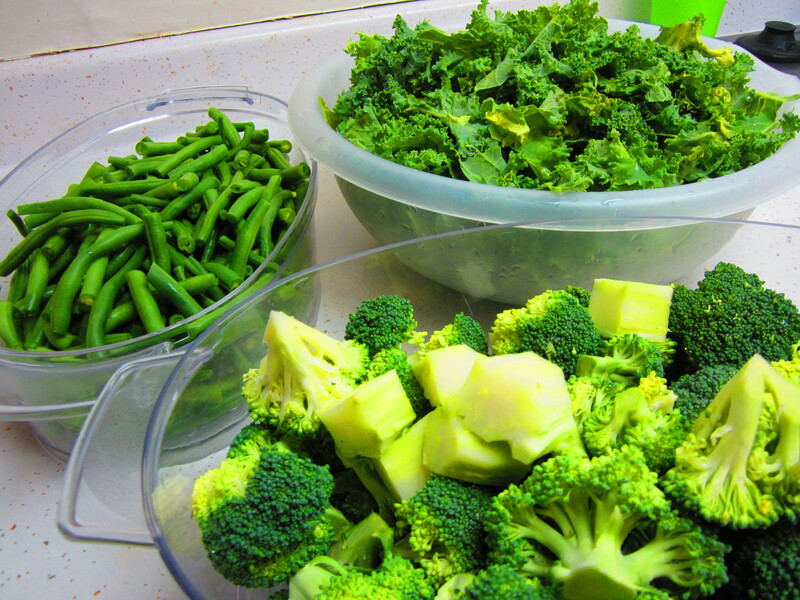 I encourage everyone to eat more GREEN FOODS.